The complete name of this product is "D-Lights - Black Forest Ham, Egg Whites And Swiss Cheese (Muffin Made With Whole Grain)". The packaging is attractive. The sandwich photographed for the box looks delicious and the printed clams of "1/3 fewer calories" and "less than 1/2 the fat" make these sandwiches stand out in the grocer's freezer. This sandwich is just barely more healthy than many similar fast food sandwiches. Each D-Light has 240 calories, 0 grams trans fat and 2.5 grams of saturated fats. Compare this to a McDonald's Egg McMuffin which has 300 calories, but also comes in at 0 grams trans fat and 2.5 grams of saturated fat. Both sandwiches offer 2 grams of dietary fiber. With "muffin made with whole grain" in such large print on the box, you'd expect more fiber. The significant word in their claim is "with". 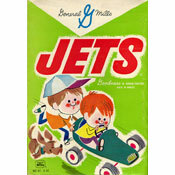 The first ingredient on the side panel is Enriched Bleached Flour (with Whole Grain Flour). It's true that D-Lights have half the total fat of Egg McMuffins (6 grams versus 12 grams), but since the percentage value of the fats you most need to avoid are the same, this claim has to be taken with a grain of salt. And speaking of salt, D-Lights actually have more sodium than Egg McMuffins (780 mg versus 760 mg). Sadly, this sandwich tastes boring compared to most fast food breakfast sandwiches. The muffin is chewy and tough. The egg is chewy with a synthetic texture. With every bite, there's no mistaking that this is a microwave sandwich. It's not horrible, it's just very, very disappointing. I paid $6.99 for a box of four sandwiches, which is significantly more expensive than most fast food sandwiches. 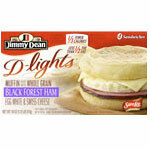 What do you think of Black Forest Ham D-Lights? See below "Black Forest Ham". Then it says "with natural juices" then below that it says in small letters, "DIPPED IN BEEF BLOOD." Is this what gives the ham it's fine flavor? Why compare this to McDonald's Egg McMuffin? You should be comparing it to other breakfast convenience foods cooked at home, not fast food from a take out place. If you compare Jimmy Dean's D-Lights meat, egg and biscuits to other similar products, even Jimmy Dean regular sausage and egg biscuits you will see that the D-Lights have only one half to one third the calories as other meat, egg and biscuit products. That is why I bought them --- because they are lower in CALORIES.